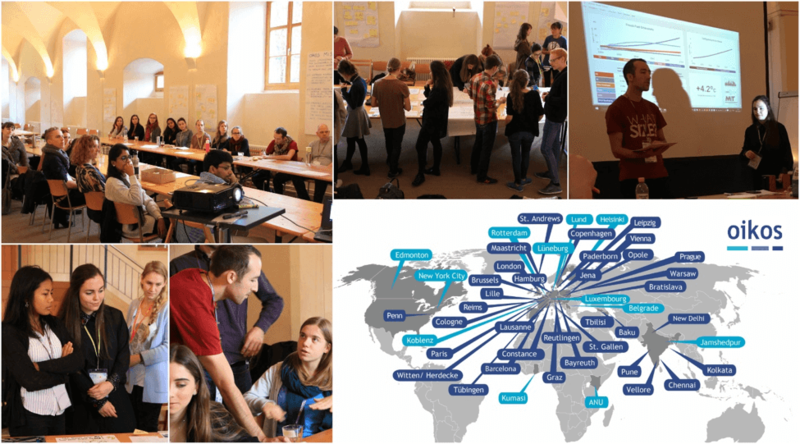 By Kathrin Zirn, Reutlingen University On 9 October 2017, a World Climate workshop was held as part of a student-driven Responsible Leadership Seminar of Oikos International in St. Gallen, Switzerland. The facilitator, was Kathrin Zirn, an International Business student from Reutlingen University, who had previously participated in World Climate simulations as part of her System Dynamics class with World Climate Ambassador Prof Florian Kapmeier. Her Oikos LEAP (Sustainability Leadership) scholarship gave her the opportunity to play this insightful game with future sustainability leaders from all around the world. After the introduction of the C-ROADS simulator, some scientific background on recent climate change science and a briefing on the respective delegations and interest groups, the participants from a total of 27 countries dived into their roles as party delegates at the UN climate summit. Once the negotiating groups had agreed on their strategy, the head of each delegation presented their pledges to the plenary. When all pledges had been made and the simulation results were visible on C-ROADS, the goal of keeping global temperature rise well below 2 degrees was still far from being achieved and the discussions, especially between developed and developing nations heated up. At the end of the workshop, the 20C goal had not been achieved, but the simulation exercise made all participants come to a crucial conclusion about the complexity of climate science and politics and the challenges that the UN states were facing. All participants were members of Oikos International, a student-driven organization for sustainability in economics and management with chapters in 45 countries all over the world. Thus, the interest in sustainability and related topics such as climate change was extremely high and kept the participants very motivated throughout the session. Here are some quotes from the participants. Sharing is caring, thus many participants concluded the session committing that they would definitely run the simulation in their home countries in the near future to spread awareness on climate change and the need for immediate action.